This life size vignette is another commissioned painting. The painting is in acrylics on compressed hardboard. The bird is an adult female and the painting is based in part on a specimen that was collected in Oshawa harbor, east of Toronto, Ontario, Canada, in the 1920s. Although it is rare for them to come this far south, each winter we do get the odd record of them here or there. 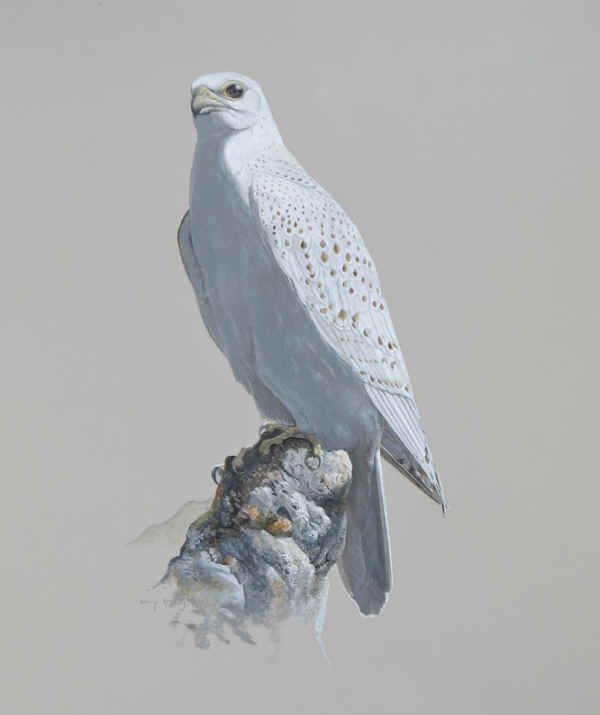 They are the largest falcon, clearly associated with the far north, and rugged northern coastlines. They are much in demand by falconers, who especially like the wild caught birds. Many years ago, with the help of numerous colleagues, I helped get the North American population protected under the Convention on International Trade in Endangered Species (CITES), which prevents international trade of wild-caught birds “for primarily commercial” purposes. Canada objected, and would still like to benefit from such trade (it is also the only range state of the Polar Bear that allows commercial trade in the skins of the animals…a very backward country when it comes to the environment, I’m afraid). There is still some illegal trade, and some populations outside of Canada are at various levels of risk, but fortunately it is harder to smuggle them with the world population now protected under CITES.